When it comes to attention to detail, Rezcomm has it in spades. In fact, walking through a demonstration of Rezcomm’s new omnichannel ecommerce Shop platform you might be impressed by the confidence it instils during the booking process. Every stage is intuitive and it’s familiar without lacking freshness. You would certainly not be surprised to find out that the flawless checkout functionality is down to a huge amount of research into customer experience and the behaviour of hundreds of system users. 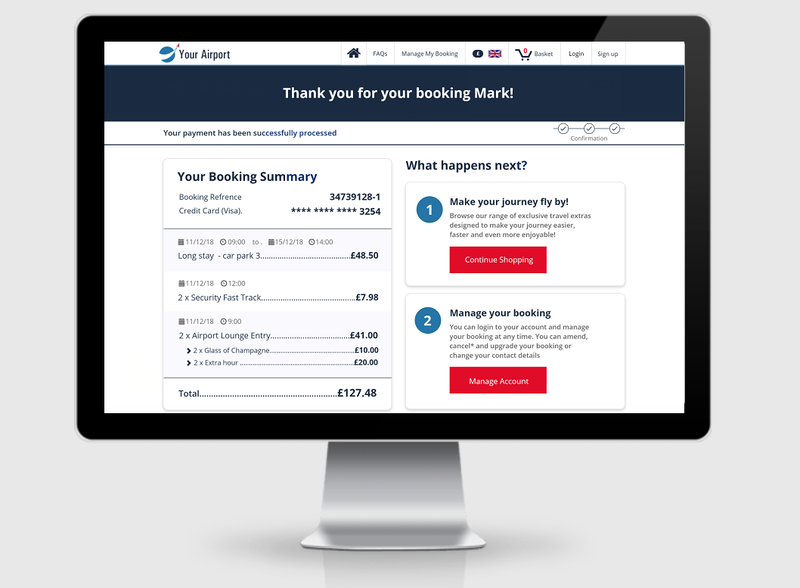 The importance of the customer checkout in any ecommerce system across industries is paramount, but particularly so in travel where the cart abandonment rate is 81.7%, significantly higher than the 72.8% in retail and the cross sector average of 75.6%. Rezcomm’s research found, for example, that the first thing many customers do on arriving at a ‘your details’ form is to scroll down the page to see how long the form is. What happens next is cohesive with research that shows 37% of people abandon their online purchases because they are required to create an account, and 28% never make it to conversion because checkout is too long or complicated. They give up. Shop answers these concerns by adding oodles of convenience. The ‘your details’ form builds as the customer fills it in making the length more manageable, and it validates in real time with a clear green tick, so there’s none of the irritation of having to go back and search out what you did wrong when the form won’t submit. Coupon codes are automatically applied too, with clear visualisation and communication of the discount received, before moving through to secure payment. It’s worth noting too that while mobile cart abandonment outpaces desktop by 16%, the Shop checkout process is especially pleasant and intuitive to use on mobile. From the airport’s perspective, forms are customisable so you can add fields to collect any extra information you might need. The checkout also offers plenty of opportunities to add value and engage your customers. You can up sell with limited upgrade offers, for example, offering a higher spec, higher cost car park option that will improve the customer’s experience. It’s also easy to cross sell, with visualisation used to great effect to showcase luxury choices such as airport lounges. This is where you can sell the airport as a destination, promoting luxury over necessity. As the customer completes checkout, the confirmation page further optimises the experience for both customer and user. As Rezcomm’s Victoria Wallace says, this page is “the most underused in ecommerce,” often showing no more than a quick “thank you” and a summary of the order. With Shop’s confirmation page it’s possible to do so much more. 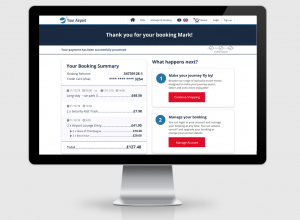 You can now use this page to offer information that supports the customer, points them towards customer service and even brings them back into the booking journey to add incremental revenue. This is also a golden opportunity to catch marketing permissions from any customers who didn’t tick the consent CTA first time round. And there’s still more. You can add links to additional products and services with affiliates too, giving the customer access to everything from swimsuits to suitcases. The airport benefits from valuable revenue and the customer gets a convenient one-stop travel shop. If your airport would like an early access demonstration of Rezcomm’s new ground-breaking parking and ecommerce platform please get in touch via rezcomm.com. Rezcomm is the trading name of Airport Direct Travel and has been providing ecommerce and travel services to airports, parking operators and venues around the globe since 2006. A recent milestone has been reached with Rezcomm now serving ¼ billion passengers worldwide. To find out more please visit www.rezcomm.com or find us on Twitter @rezcommtech. Any question regarding this story or potential content partnerships please contact Sarah Marks, Head of Marketing and Communications at Rezcomm: sarah.marks@rezcomm.com or on 01392 759304.